Free Knitting Lessons; ages 7 & up! Learn to make 2 dishcloth squares, one to keep...one to donate to St. Paul's Prayer Blanket Projects. Please Bring size 7 or 10 knitting needles. 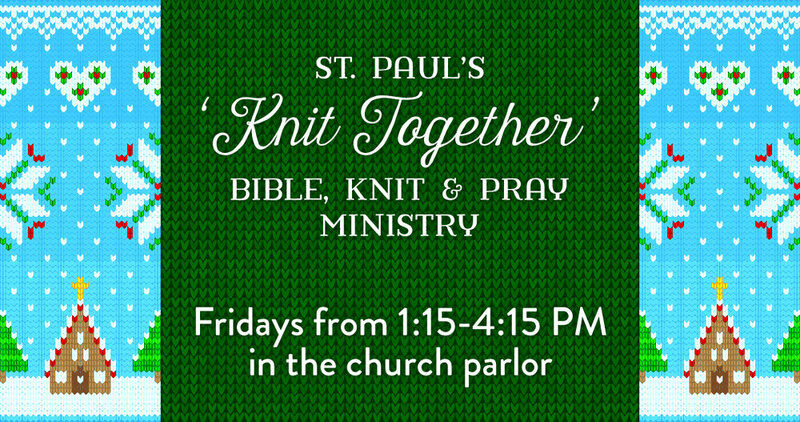 All our St. Paul's knitting projects yarn will be supplied, free! Praise the Lord! Welcome to all fiber artists, crocheters and sewers, please feel free to come enjoy, sit-in and work on your own projects together in loving company. We keep some extra knitting needles on hand so you can just come any time, pop in and give a good try, learn a new talent for the Lord! Great thanks to the OGCMA, & Linda at Hub, For hosting us this summer! He is so Good! Brush with Kindness 2016: Thanks!